Anihan Technical School 2014 graduate, Vilyn So, is a Kitchen Manager of Dean and Deluca. Anihan 2014 graduate Vilyn So is the only daughter of a daily wage earner and an OFW. She is the second child in their family and has three brothers. For financial reasons, they moved to Laguna nine years ago and Vilyn transferred from studying in a private school to a public school in her second year in high school. When Vilyn was studying in Anihan, she was at the top of her class. 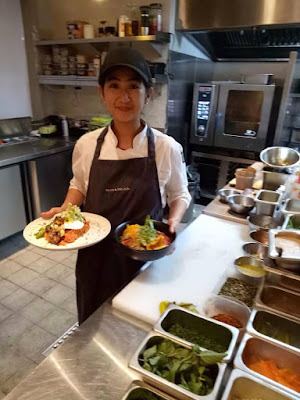 She did her on-the-job-training in Rambla, a Mediterranean restaurant in Rockwell Center in Makati. After her graduation, she was absorbed as part of the kitchen team. After two years, she moved to another restaurant in Rockwell Center called Dean and Deluca. Being smart, hard-working, and possessing good work ethic, she was soon promoted to the position of kitchen manager. Vilyn goes to the the Dean and Deluca branch in Rockwell Center on some days and to the branch at Eton Building along De la Rosa St., Makati on other days. Vilyn was invited to give the graduate testimony for Anihan's graduation rites in 2016. Hearing and seeing her, many graduates, parents, students, and guests were inspired with what she has achieved professionally in only three years. Aside from helping her parents in sending her brothers to school, she was able to get her own house for which she is paying by installment. She considers this as her first major investment. Read more about Vilyn's testimony in The Road to Success: Anihan Graduate's Testimony.